Fig. 1. Gassed by John Singer Sargent (1856-1925), 1919. Signed and dated “John S. Sargent Aug 1918” at lower left. Oil on canvas, 90 ½ by 240 inches. Imperial War Museums, London, © IWM Imperial War Museums. Not with a bang . . .
You know the rest. Thomas Stearns Eliot did not fight in or write about World War I, but his poems of cultural and spiritual exhaustion are among its most durable literary legacies. Fig. 2. For Every Fighter / A Woman Worker / YWCA / Back our Second Line of Defense, poster by Ernest Hamlin Baker (1889-1975), 1918. Color lithograph, 42 by 28 inches. Library of Congress, Washington, D.C., Prints and Photographs Division. However our world ends, World War I was where it began. Eliot didn’t say that, but you can see it for yourself in the exhibition World War I Beyond the Trenches, which originated at the Pennsylvania Academy of the Fine Arts as World War I and American Art in 2016 and opens at the New-York Historical Society on May 26 (to September 3) before moving to the Frist Center for the Visual Arts in Nashville (October 6 to January 21, 2018). Seven years in the planning at PAFA, this is the most intelligent use of museum know-how I have seen in a long time. Eighty artists are represented in some 180 works of art: watercolors, lithographs, drawings, photographs, cartoons, posters, sculpture, and oil paintings from many institutions and private collections. Additionally, the catalogue has several superb essays—for instance, Amy Helene Kirschke’s on W. E. B. Du Bois and the war effort—that combine art history with political and social history. If, as the organizers suggest, the influence of the war on American art has been overlooked, that may be because the artistic responses to it on this side of the Atlantic were so varied. From the soft-edged jingoism of Childe Hassam’s flag paintings to the bitter antiwar drawings by George Bellows, John Sloan, and others in The Masses, from Lewis Hine’s stark documentary photographs to the unaccountably weird landscapes of Charles Burchfield (of which more later) to the posters urging men to “ENLIST,” there was no artistic consensus. By contrast, major American writers—Ernest Hemingway, John Dos Passos, E. E. Cummings, and even Wallace Stevens— all sounded in their different ways similar notes of disillusionment that stayed with them, even as they moved on to other artistic pastures. As you walk through the exhibition, the sheer variety of art begins to tell the story of a country just coming into consciousness of itself without arriving at any one notion of what it might mean to be American. The frequent presence of African Americans and the prominence of women here are interesting and revelatory, as one would expect from PAFA, where recognizing the significance of race and gender in our visual culture has long been a commitment. Elsewhere, the notes of xenophobia and kitsch are less surprising but no less interesting. It’s all here, seemingly unencumbered by some overall thesis or point of view. Fig. 4. After the War, a Medal and Maybe a Job by John Sloan (1871-1951), 1914, published in The Masses, September 1914, with the caption “His Master: You’ve done very well. Now what is left of you can go back to work.” Signed and dated “John Sloan ’14” at lower right. Charcoal and crayon on paper, 12 ⅞ by 19 ½ inches. Library of Congress, Washington, D.C., Prints and Photographs Division. Fig. 3. Flags on 57th Street, Winter 1918 by Childe Hassam (1859-1935), 1918. Signed and dated “Childe HASSAM 1918” at lower right. Oil on canvas, 35 ¾ by 23 ¾ inches. New-York Historical Society, bequest of Julia B. Engel, photograph © New-York Historical Society. Of course, that is what makes the exhibition difficult to describe. The war was far away, this country was late to enter it, and the duration of American engagement was about nineteen months. And yet, if there is a message here it is that the war went deep into many places that will surprise viewers. For instance, on assignment in France, the insouciant John Singer Sargent produced a masterpiece: Gassed, the most un-Sargentlike of his more than three thousand works. You can say that the expatriate Sargent was not so very American, but that is not what you take away from this canvas of men blinded by mustard gas. You are struck by the immensity of the suffering the artist conveyed in this immense painting, the blindness inflicted on men, the moral blindness of the war, all delivered in an inescapable mustard-colored gloom. In another context, Robert Cozzolino, one of the show’s organizers, quotes a passage in a letter from a German soldier to the surrealist painter André Masson: “it isn’t being wounded or killed which is terrible, it’s what one sees.” Sargent saw and what he saw was transformative. How admirable that this vast painting, seldom seen because it resides in London’s Imperial War Museum, is here. Fig. 5. Dog Fight over the Trenches by Horace Pippin (1888–1946), 1935. Signed “H.PIPPIN” at lower right. Oil on canvas, 18 by 33 ⅛ inches. Hirshhorn Museum and Sculpture Garden, Washington, D. C., gift of Joseph H. Hirshhorn; photograph by Cathy Carver. Charles Burchfield did not see the war. He did not paint it either, and yet he is represented in the exhibition by several works. They may look like scenes of battlefield destruction, but they are drawn for the most part from Salem, Ohio, where Burchfield grew up. Why are they here? Take a look and then read the catalogue essay by Alexander Nemerov, whose leaps of imaginative understanding make him the Evel Knievel of art historians and someone this magazine is fortunate to publish on occasion. If I could capsulize Nemerov’s essay on Burchfield’s The First Hepaticas and its relevance to the war, it would not be an essay by Alexander Nemerov. Let me just suggest that Burchfield felt the war. The way in which his anxieties and imagination seeped into his works of art is there in The First Hepaticas, but you need to see that for yourself . . . and read Nemerov’s essay, another work of art. Fig. 6. The First Hepaticas by Charles Burchfield (1893–1967), 1917– 1918. Watercolor, gouache, and pencil on paper, 21 ½ by 27 ½ inches. Museum of Modern Art, New York, gift of Abby Aldrich Rockefeller; Museum of Modern Art, New York/SCALA/Art Resource, NY photograph. Fig. 7. Colored Man Is No Slacker, poster printed by E. G. Renesch, Chicago, 1919. Chromolithograph, 20 by 16 inches. Wolfsonian–Florida International University, Miami Beach, Mitchell Wolfson Jr. Collection. World War I may be “the forgotten war,” as the organizers of this exhibition suggest. Certainly, some of the artists represented were anxious that it not be. Horace Pippin, the African American wounded in battle who came home to paint his memories and record them in his journal was one. Claggett Wilson, himself all but forgotten, was another. One pleasure of the exhibition is seeing the several works by Wilson that have been rediscovered and rescued from obscurity. He gave many of them long explanatory titles to bring the war home to the ignorant and the indifferent. My favorite of these is this one: Flower of Death—The Bursting of a Heavy Shell—Not as It Looks, but as It Feels and Sounds and Smells. A detail of this painting is on the cover of the catalogue as well as the posters publicizing the exhibition. Unforgettable. Fig. 8. 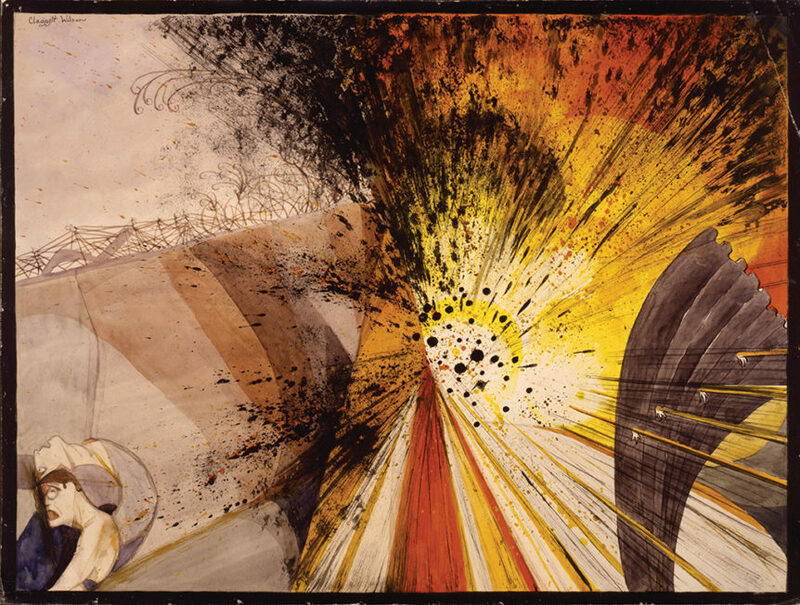 Flower of Death— The Bursting of a Heavy Shell—Not as It Looks, but as It Feels and Sounds and Smells by Claggett Wilson (1887–1952), c. 1919. Signed “Claggett Wilson” at upper right. Watercolor and pencil on paperboard, 16 ½ by 22 inches. Smithsonian American Art Museum, Washington, D. C., gift of Alice H. Rossin; Smithsonian American Art Museum / Art Resource, NY photograph.